Cake debuted a new video today on MTV's website. The video is for their second single off of Showroom of Compassion called "Long Time". It was surprising to learn it was an animated video. The group collaborated with Callicore Films, a French production company that has an an art studio that focuses on CG Art and a self-proclaimed resistance against "the cultural dictatorship of media". Cake is very anti-lots of things so it is a good fit. The video is basically a story of a vagabond and his monkey. Monkeys rule. 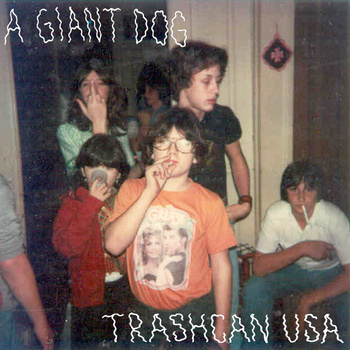 A Giant Dog are one of many talented garage rock bands based here in Austin. They perform tomorrow (4/1) at Club de Ville at 7:00pm. Like with many local bands here in Austin, there is always a struggle to get people's attention in this crowded field of local talent and of course the constant stream of popular touring acts. For more details, visit our preview on Red River Noise here. Viva! Lady Gaga & a mariachi band sing "Born This Way"
Someone captured this classic moment of Lady Gaga celebrating her birthday in L.A. at Bar La Cita. This is the kind of golden footage YouTube was made for. Rise Against released a new video for their single "Help Is On The Way" last week. I'm drinking any flavor of Kool Aid they serve.What a great song and video! See you at Stubb's on April 19. This chick has been all over the music magazines, including two covers recently, and European press of course. Lykki Li is going to be a festival headliner soon. I just sense it. With amazing stage presence and that incredible voice, she can go far. I think she fills the void that Amy Whinehouse left and Duffy tried to fill but couldn't. Labels: british, Female Vocalist, i know places, lykke li, music video, Soul, u.k.
Pictured above is Sarah McIntosh from The Good Natured. I know what you are thinking....looks uber hipster. True. However, I can forgive looks if the music is good. And to my surprise it is. The other surprise was that this U.K. based indie star in the making is not old enough to legally buy beer here in the U.S. I got wind of the band as I was looking through the countless number of bands coming to South by Southwest. If The Good Natured don't make it big after SXSW, I'd be shocked. Watch the video for their single "Be My Animal" below and check out their SXSW schedule. Labels: be my animal, indie, sarah mcintosh, SXSW preview, the good natured, u.k. I don't post a lot of SXSW related stuff on my blog, almost none at all actually. I like the festival just fine, but it is just that I think I'm so jaded that nothing excites very much anymore. If I was indie crazed or into free booze parties, then maybe I'd be more excited. That being said, I am pretty school girl giddy over the Fat Wreck Chords Showcase. 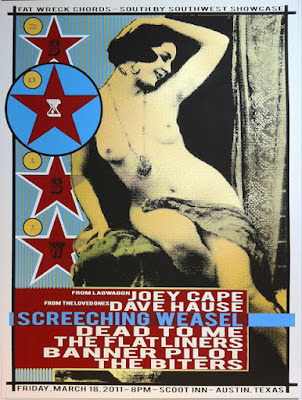 Two words: "Screeching Weasel". 'Nuff said.